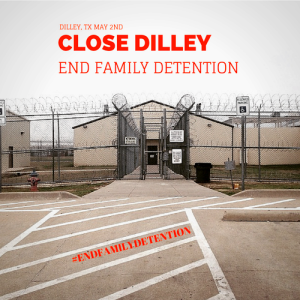 End Family Detention in Dilley! “My sister has been incarcerated for 9 months. What did she do to deserve this? She was escaping a terrible violence and now she is living another nightmare at Karnes with her son.” Ana Jovel, sister of a detained mother, detained with her 10 year old son. Join United Methodists, faith and immigrant groups for a march and protest in Dilley, Texas on Saturday, May 2. We will be there to protest the shameful practice of family detention. In collaboration with a coalition of national advocacy and faith groups, we will converge on the Dilley detention camp (a former “man camp” for oil workers) which is now being built into the largest immigrant detention center in the U.S.
Help us amplify the voices of the mothers and children detained at Dilley and in Karnes City, Texas and Berks, Pennsylvania. We will demand that family detention, and ultimately the whole system of immigrant detention, be ended! When: Saturday, May 2. The march and protest will last from about 12 p.m. to 3:30 p.m. However, folks traveling on buses from Austin, San Antonio and elsewhere should expect to be with us from early morning to late afternoon. What: We will march from downtown Dilley to the family detention camp where we will hold a rally with songs and chants, street theater, speeches from people directly affected by immigrant detention & deportation, and a time for prayer and statements from people of faith. If you are not able to march, there will also be a group going straight to protest site. How to get there: United Methodists will have vans from Brownsville/McAllen and Austin. Grassroots Leadership is organizing buses from Austin. They can also connect you to others in your area who are going to coordinate rides. See UMC contacts below to let us know you are coming and coordinate transportation. Other details: The organizers will provide lots of water and healthy snacks. If you need a more hearty lunch or have special dietary needs, plan on bringing your own food. Dress comfortably. It will be hot. Those with mobility concerns can ride directly to rally site on Grassroots Leadership busses, which will have accessible restrooms. Those who cannot stand throughout the rally can rest on these busses. Feel free to bring your own signs and banners. We will also have UMC signs and organizational banners. Learn more about family detention here and here.